There is atomic explosion in Sun every 11 years. This particular occurrence has got more to do with astronomy and less with astrology. Since human senses are not receptive enough to feel the atomic explosions in the Sun, we seldom experience any noticeable effect of these explosions directly. However, trees are very sensitive to such astronomical events and their effects. 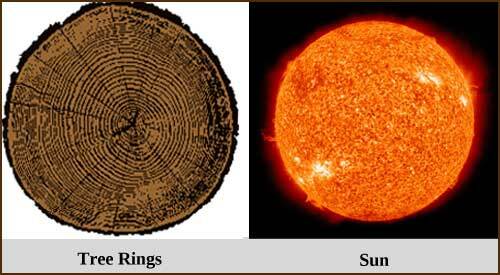 If you look at a cross-section of a tree, you will see many rings/ circles. These rings help us determine the age of the tree. During a research, it was found that every 11th ring (ripple) was deeper. The scientists concluded that the deeper rings were created because of the atomic explosions in the Sun. The trees do experience the change in the power generation in Sun. The rings also suggest major climatic changes at the time of atomic explosions in the Sun. Also known as Polar Shift, this phenomenon is nothing but atomic explosion in the Sun. It is to be noted that it's not energy discharge by the Sun. The energy of the Sun gets multiplied by such explosions. In other words, such explosions keep the Sun burning. It always happens in cyclic manner. Because of this explosion the magnetic poles of the Sun — which are like the ends of a giant bar magnet — will get flipped, the polar north will become the polar south and vice versa. This periodic reversal was linked to the motion of plasma flows inside the Sun. The flow of this hot, electrically-charged material tosses and turns one component of the magnetic field into another, eventually changing the Sun's dipole field. Since most of this hot material is absorbed back in the Sun, there is no scope of it reaching us on the Earth directly. Nevertheless, the change happening at such a distance is powerful enough to affect us. But we tend to remain so busy in our lives that we hardly notice effects of this atomic explosions. According to scientists and researchers, this particular cycle of atomic explosions is one of the weakest so far. Talking about the climatic changes, we have already been experiencing some major climatic changes since November/ December 2012. However, barring natural disasters that happened after December 2012, nothing should be attributed to the atomic explosions. Mad-made distastes and crisis should not be attributed to this 11-year cycle of Sun.